Merry & Bright Oh & Happy Weekend! I've had a lovely day today creating our Christmas windows and rearranging the shop for our Christmas look. I really love having the entire day free of appointments to spend in the shop pottering around and being creative. I am so happy with our Christmas look this year. It is very fresh and of course very colourful!! I've posted lots of pictures above for you all to see. 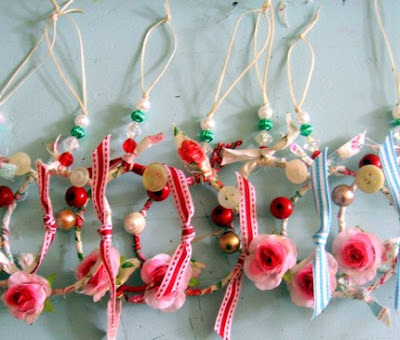 We made the wreaths ourselves using fabric remnants, tuile and a few pretty ornaments. I'll try to take a few more night time shots of the windows next week to show you as the day time pics don't really show up very well. I am getting my sign writer to sign write "Merry & Bright" on each of the large front windows of the shop early next week as our Christmas slogan which I think is very fitting. Hope you all have a great weekend and don't forget to look back on Sunday night to see this week's Absolutely Beautiful Christmas Competition entries!! 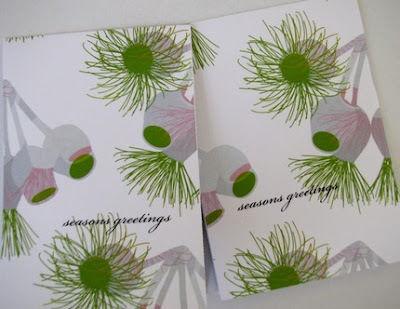 I love these Australian Gumnut Christmas Greeting cards by Tsk Tsk @ Etsy. 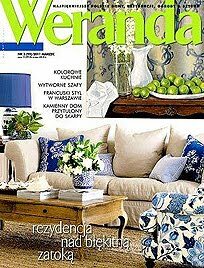 So lovely to see a modern take on Australiana!! 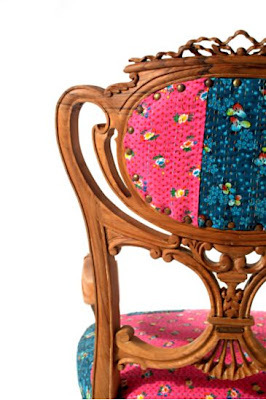 I was recently asked to select some fabrics for some chairs which needed recovering at the new Emporium Hotel in Brisbane. 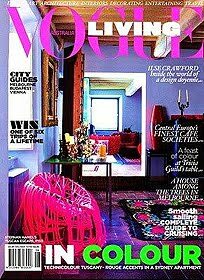 Previously these chairs were covered in a matt silver pvc which I personally didn't think made much of an impact. The hotel's signature colour is red so I selected this gorgeous red zig zag fabric and what a statement it makes as you walk into the bar. I have now been asked to also select a new fabric for the curtain in the background which I am currently in the process of doing and there is possibly some very exciting things hapenning in the pipeline which I can't talk about at the moment but I should be able to announce something within the next month or so!!! Shh for now though!! 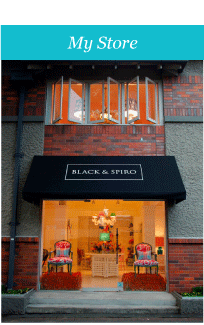 Friday this week we are installing our Black & Spiro 2007 Christmas windows. My assistants, Avril and Tess are working hard like little busy elves preparing for the installation. I'll post pictures once everything is up for you all to see. On another note, thanks so much for the wonderful response to my Christmas Competition. I've already received some lovely entries and I can't wait to receive some more. I'll be posting the first batch this Sunday night. To enter, please email me anna@blackandspiro.com.au some pictures of Christmas in your home or home town/city with a brief description of what Christmas means to you. Depending on how many submissions I receive I will post each one in a once a week posting which will contain all of the submissions I have received that week. I will be asking readers to vote each week on which one they like best and then 4 days before Christmas I will post the finalists and then ask readers to again vote on the one which they feel should win the competition. I will announce the winner on Christmas Eve. The winner will receive one of my custom made one off Black & Spiro Couture cushions. I will email the winner some of the cushions currently available and they will be able to select which one they want. The cushion will be posted out to the winner. I can't wait to see what happens at Christmas in your town/home. Please don't be shy about sending in your submissions - I think we will all love seeing what other people around the world get up to at this beautiful time of year!! Oh, and by the way I will be treating Jill's images above as my first submission. I will post her images again at the end of this week with the beautiful email she sent me. 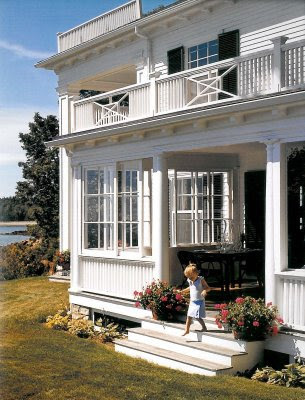 I finish this week with this undeniably beautiful white house via Habitually Chic. Oh to have a home like this perched on the water and surrounded by a mote of lush green grass! I must say a huge thanks for your beautiful comments this week - you are all so very kind!! I was pleased to hear that I'm not boring you all!! Just a reminder to check back on Sunday night as I will be announcing my very exciting 2007 Christmas Competition!! Until then, have a lovely weekend!! Over the last couple of months I have been helping my dear friend Annie decorate her absolutely beautiful new home. I thought I would show you a little sneak peak of the house with more pictures to follow within the next couple of weeks. I was very excited to receive an early Christmas package in the mail today from a special friend in the U.S. Inside the gorgeously wrapped gift (and yes that is a Kate Spade Christmas card) was the very last edition of American House & Garden - what a treat! Thank you Courtney!! Christmas seems to be creeping up on us again and I am so excited as this is by far my favourite time of year. 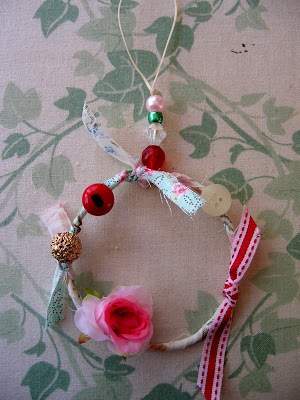 To start the season I am posting these gorgeous ornaments and wreaths by "Nest Pretty Things." I am also very excited about an Absolutely Beautiful Things Christmas competition which I will be announcing this Sunday night 25th November so do stay tuned as there is a beautiful prize to be won!! I know you are all probably getting really, really bored of seeing the pictures of my new house so I promise this post will be the last one for a while but I had to show you my dining room. As we have moved into a smaller house due to moving into the city the one concern I originally had was where I was going to hang all of my paintings. After much thought, I decided to hang alot of them wall to wall and ceiling to floor in my dining room and I am so happy with the outcome even though it did take alot of planning as to the layout. 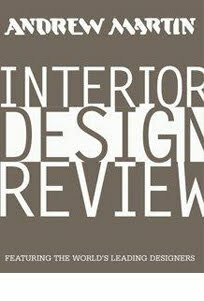 It has created a very interesting look and feel in the room. I can't wait to have my first dinner party in there. I found this gorgeous vintage oil painting over the weekend which I absolutely love. 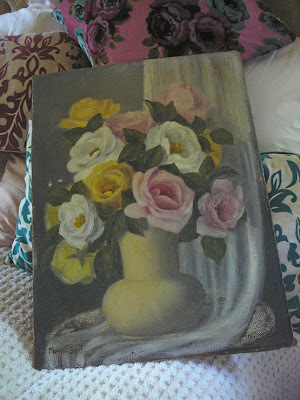 It wasn't as cheap as the other vintage painting I purchased last week but I was still happy to pay $70.00 for it. 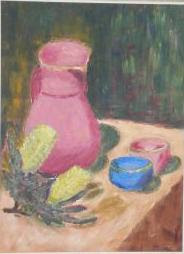 I am trying to collect a few of these old paintings to hang in a cluster on a wall in my "Anna Room" at home. Do you crave a restful, serene, simple, stylish, luxurious bedroom? This bedroom by Thomas O'brien via Studio Annetta is all those things. I love the mirror front wardrobe doors and the all white colour scheme is so restrained and simply beautiful! 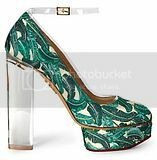 A couple of gorgeous things from Free People above. 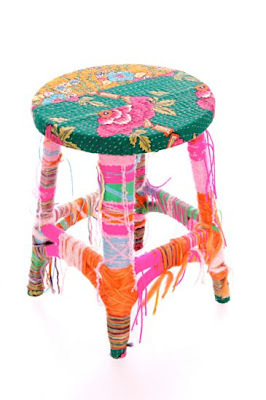 I think the fabric covered stool is particularly cute and would look gorgeous in a little girl's bedroom. 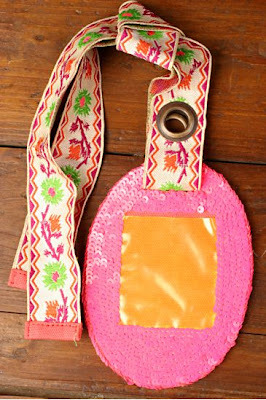 The luggage tag at the bottom is very sweet too. Unfortunately for us Aussies they don't ship to Australia but if you have a US postal address you can access these very cute wares. I've been having a lovely weekend so far. Last night we had some friends over for dinner. My friend Annie gave me three pots of flowering Hydrangea as a house warming present which I absolutely love. I'm thinking I might plant them in pots to put around the pool. This morning Harry and I have been pottering around the house. We popped out a for a little while to the book shop as I wanted to pick up a copy of Bill Granger's latest book - Holiday. I really enjoy Bill's books. Not only are they fantastic cook books, they are also picture books filled with beautiful things. I enjoy seeing which plates and bowls he uses to display his food on as they are always so stunning and the locations are beautiful too. This lastest book doesn't disappoint. Later this afternoon my friend Jody is going to drop in for a cup of tea and my mum might drop in too. I love weekends like this with no real plans just pottering around enjoying my pretty house!! Since I posted the picture of my entrance table earlier in the week I have tweeked the tablescape a little as above. To end the week I thought I'd post a few more pictures of home as it is coming together. It's all shaping up really well and it's starting to feel alot more like MY home which makes me feel very happy. I was finally able to unpack my clothes into my wardrobe last night which was a huge relief - living out of boxes is almost coming to an end - hooray!!! Hope you all have a lovely weekend and I'll see you next week. Tonight I was lucky on Ebay unlike last night! 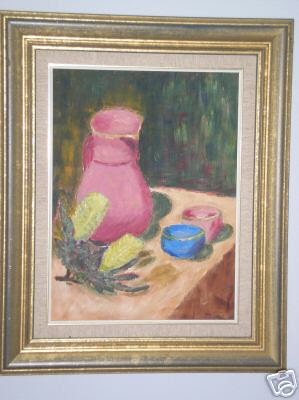 I actually remembered to bid (without reminders) on this vintage still life oil painting and I won it for a mere $14.00!! I plan to take the rather unfortunate frame off and either hang it without a frame in a cluster or look for a gilt ornate vintage frame to place it in for my new house. 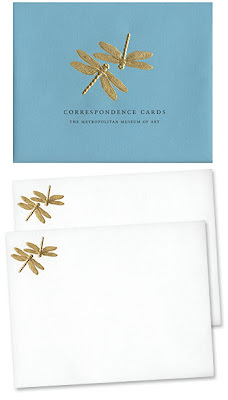 I love these correspondence cards available online from The Met Store (Metropolitan Museum of Art New York). 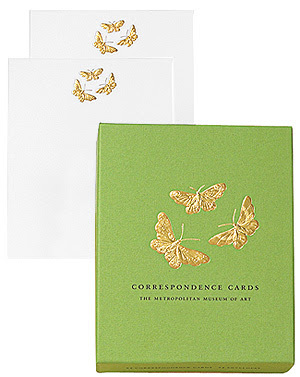 I tend to be drawn towards butterflies so these little gold embossed cards completely drew me in!! 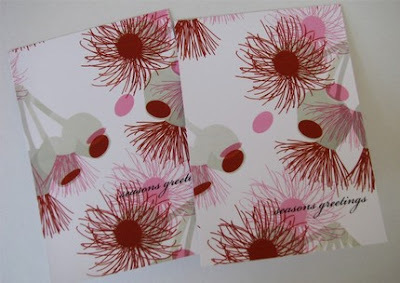 I also adore the dragonfly cards as above with the gorgeous Tiffany blue box!! This design is taken from a hair ornament (circa 1904) by Louis Comfort Tiffany - one of America's most noted decorative artists which is now in the Met's Museum collection. I think a box of either would make for a gorgeous Christmas gift for a close friend! !